The CDBU is right to emphasise the present danger. It was immediately apparent that the reforms introduced after the May 2010 election shifted away from a balance between the public and private benefits of universities, and to an overwhelming emphasis on individual return on investment and market driven competition. The core weakness in the Coalition’s approach to higher education in Britain is the surrender of the case for public goods in favour of a relentless insistence on private benefits and pseudo- market competition (there can be no real market for student places when both price and supply are centrally regulated, as is currently the case). 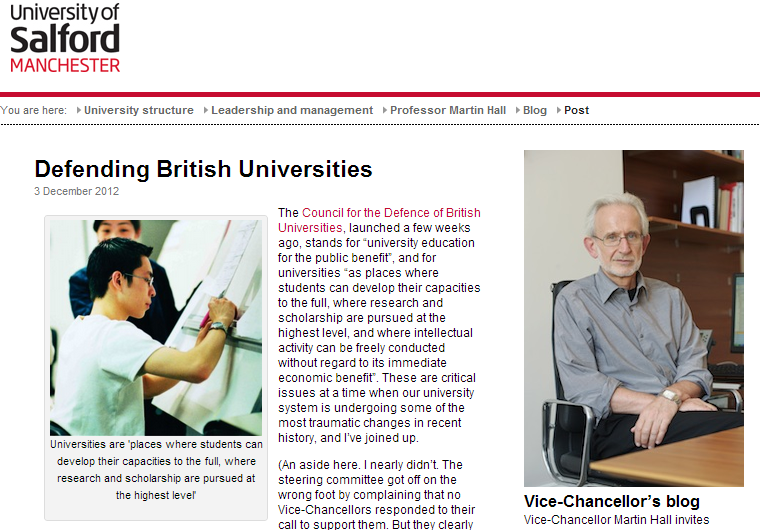 This is the hub of the case made by the Council for the Defence of British Universities, and why this is a movement worth supporting. The CDBU will roll out a major membership campaign early in 2013. Starting with learned societies and other academic organisations, then moving via students and alumni to the general public, it will be complemented by further targeted recruitment of key individuals. Meanwhile, all those who share our aims — whether academic or administrative staff, students, alumni or concerned members of the general public — are warmly encouraged to get in touch.